Believe you me it was riddled with adolescent angst. So I did the sensible thing and, first chance I got, I checked it out for myself. In 2007, DC Comics launched MINX Books exclusively for girls. MINX graphic novels contain smart, original stories about real girls in the real world. From risk takers to troublemakers, these protagonists don’t just play by their own rules, they make them up as they go along resulting in unexpected adventures. I think the summary apt, but when I nabbed THE PLAIN JANES from my Young Adult section, never did I expect such poignant storytelling about the transition between city-life and suburbia of which I read on the back-cover. For in Metro City (strikingly similar skyline) something went … well, real wrong. There is wreckage and harm, and Jane’s family does not simply move to the ‘burbs, they escape there. Jane cuts her hair and gets some new digs and goes to a new school, fully intending to be “the Rebel” and avoiding those sorts with whom she used to hang – with all good intentions, of course. But her strain of Loner-dom passes in a page when she makes friends with the rest of the Janes (three of them, in fact) who kind of makeup an adolescent motley Spice Girls (there’s the sporty one, the artsy one, the brainy one …). Loners unite! : with their alternately nerdish, tomboyish, dramatic, and — well, whatever Main Jane is — powers combined, they participate in their own extracurricular called P.L.A.I.N. (People Loving Art in Neighborhoods). It’s fuzzy street art: stuffed animals in the lawn of the animal shelter, snowcaps on fire hydrants, garden gnomes amassing. The endearing between-the-lines of it all is a story of interconnectedness, of support and friendship – and protest, when the adults of the town misconstrue the above as “attacks.” A sign in the construction zone where rubble was reorganized into three pyramids reads: “The Pyramids lasted for thousands of years. Do you think this Strip Mall will? Art Saves. Think Big. Think P.L.A.I.N.,” wherein the general act is one to simply inspire discussion among people who don’t usually get together. Good, insulting – whichever; at least people are chatting. The adults, however, condemn these actions, imposing curfews and fines. Jim Rugg’s paneling is attractive and clean. While uncluttered and anatomical and with a degree of welcome detail (like a consistent newspaper layout maintained through several images as seen at different angles: its writing is never just squiggles, and the photograph on the front page is always discernible), Rugg’s artwork doesn’t so much inspire the sort of praise I gave Bong Dazo, but it is easy on the eyes and “complete” without being busy. The black and white option is appropriate for communicating all the shades of gray, but that’s all I got to say about the art this time around. Cecil Castelluci offers a free, downloadable discussion guide for THE PLAIN JANES and other novels for use in the classroom or a book club. While completely appropriate from grades six and up, The Plain Janes deals with the fear of contemporary terrorism, what stringent regulation and isolation and unhappiness results from said fear, and the young adults’ role in so big a societal quandary. As many are on the brink of leaving their homes for colleges, for exercising their independence, such reading probably inspires at least some thought about one’s place in the bigger picture. 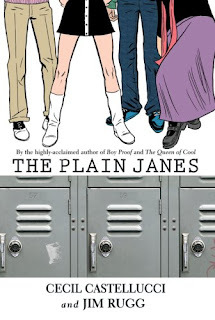 Cecil Castellucci and Jim Rugg’s The Plain Janes was — I swear — my predecessor’s enlightened addition to our YA library! Clever and charming, smart, and nicely styled, it is easy to read multiple times (and it’s just right in length). Plus, it’s a great way to indoctrinate future Liberal Arts majors with the much welcomed reassurance that “Art Saves”! Oh, and it’s cheap too. THE PLAIN JANES is available almost everywhere for under $10. I just got this a few weeks ago after hearing Cecil Castellucci on cbc. Love it. Have read it twice since. Sounds great! Can't wait to take a look for myself. Have you read/reviewed American Born Chinese yet? Also, certainly more appropriate for the high school crowd, Blankets? Am born Chinese is one we are interested in. I just ordered American Born Chinese for the YA Graphic Novel section. Just came in and I'm interested in taking a look at it. Thank you so much for the kudos! Tracy (who I met coincidentally the other day) pointed me to your post. I thought I would let you know that there is a discussion guide for Plain Janes (and my other novels) at my website that is free to download and use in classroom or bookclub.